I gotta know - does anyone like the stuff? Personally, I've always hated it. 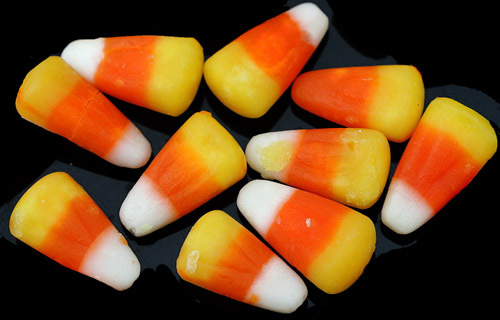 I'm with you - Candy Corn is pretty gross. I hate hate HATE it. B loves it, so he bought a small bag this year, and I tried one to make sure I still hate it. I spit it out, it was so gross. Didn't like it when I was a kid, but for some strange reason, I like it now that I'm an adult. Go figure. I love it, to a point. I won't eat it until I'm sick, but there's something about the waxy, overly sugary simpleness of it I can't resist. I'll eat it, but I don't buy it. Not my favorite. Serious Eats has a homemade recipe just posted in the last few days. But it seems like a lot of work for a bit of sugar. My secretary would put it out in a chick feeder. It was really cute. me. sorry. love the stuff so much. I don't buy it anymore or else I would make myself sick on it.